What if nearly everything you thought you knew about the use of colour was wrong? What is really known about human response to colour, particularly in a healthcare setting? Are colour design guidelines for healthcare environments supported by scientific research findings? It appears the answers, according to Ruth Tofle and her team, are: very little and hardly any. In 2004 the Coalition for Health Environments Research (CHER) commissioned a definitive review of existing research into the use of colour in healthcare environments.1A full copy of the report can be downloaded from here. The scope of the review is extraordinary, spanning the disciplines of art, architecture, the physical sciences, behavioural sciences, and the combination of these fields. There is not sufficient evidence to support direct linkages between particular colours and health outcomes of people. The popular press and the design community have promoted the oversimplification of the psychological responses to colour. Many authors of guidelines tend to make sweeping statements that are supported by myths or personal beliefs. Most colour guidelines for healthcare design are nothing more than affective value judgments whose direct applicability to the architecture and interior design of healthcare settings seems oddly inconclusive and nonspecific. In the wake of this review, as designers, we are left with a common evidence-based problem: how to work with unreliable evidence when we have to make design decisions, often with clients insisting on a performance-based outcome. On the plus side, this review goes a long way towards shattering some harmful myths that have become part of accepted disciplinary knowledge. At the very least, we now have the ability to advise our clients more clearly on what colour can and cannot do. Although, currently, there appears to be no reliable evidence to help us understand the emotional impact of colour, there is some useable knowledge about how colour can affect our perception of spatial qualities and those concepts can be explored through design. Clearly, greater care should be taken to avoid attributing affective properties to the use of colour in any environment. 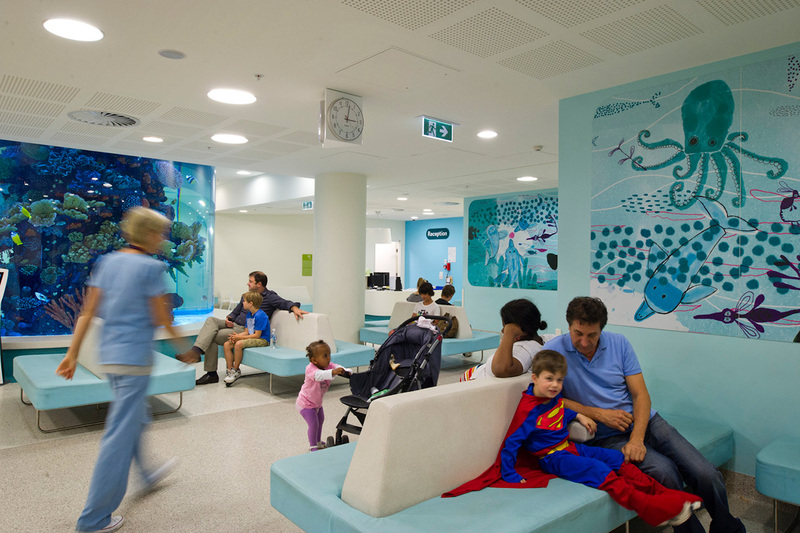 However, as can be seen from the images of Hopkins Architect's ECH in London, and the RCH in Melbourne by Bates Smart and Billard Leece, colour can be effectively and creatively deployed in healthcare environments, particularly in children's hospitals. Our primary concerns should be limited to any assertions of predictable, performative value. According to Ron Billard, director of the Billard Leece Partnership, the colour strategy was simply to create "a coherent, varied, integrated and child friendly environment, while assisting people with wayfinding through the hospital." The colour schemes directly referenced the natural Victorian environment and were intended simply as a distraction for children who are ill or undergoing difficult procedures. The degree to which the colour scheme plays a role in this distraction would be a worthy research project in itself. 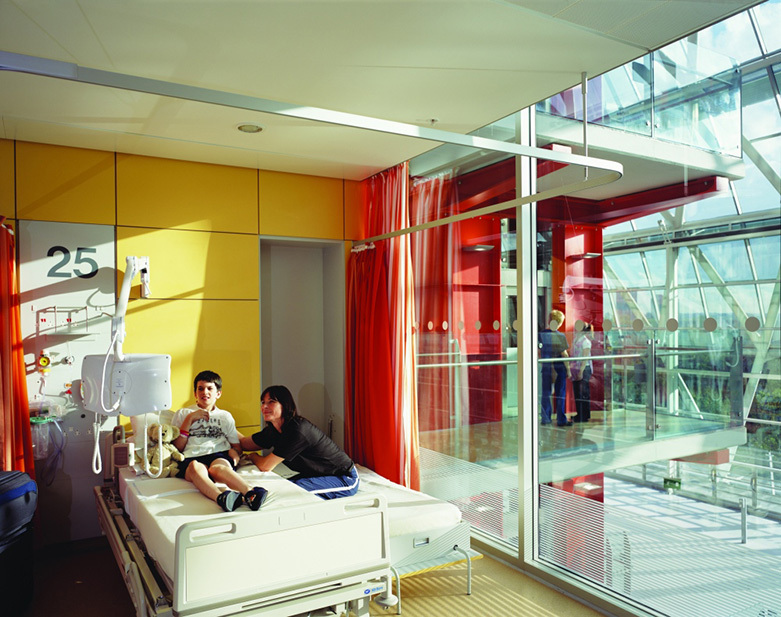 Royal Children's Hospital, Melbourne, by The Billard Leece Partnership and Bates Smart. A typical in-patient bedroom. Photograph by Shannon McGrath. Click to enlarge. When all is said and done, research about the use of colour in healthcare environment remains important and should be continued, although the subject matter is complex and multi-layered. Given the new digital tools available to us, it is inevitable that patterns of shared response will emerge in time, but more reliable research methods are needed and local variations must be accounted for. For this to occur, designers must become actively involved in this research effort because the application of research findings in healthcare settings also requires new thinking about how evidence is used in the design process. Data becomes a basis for design speculation, to stimulate creativity and not to search for absolute answers, and the outcomes produce new research questions. The purpose of EBD is to provide designers with strategies for using even the most limited research, so in subsequent articles we will evaluate new research that has emerged (with mixed results) since the CHER review. In discussion with the authors, we will salvage what we can from over fifty years of theory in this contentious field. 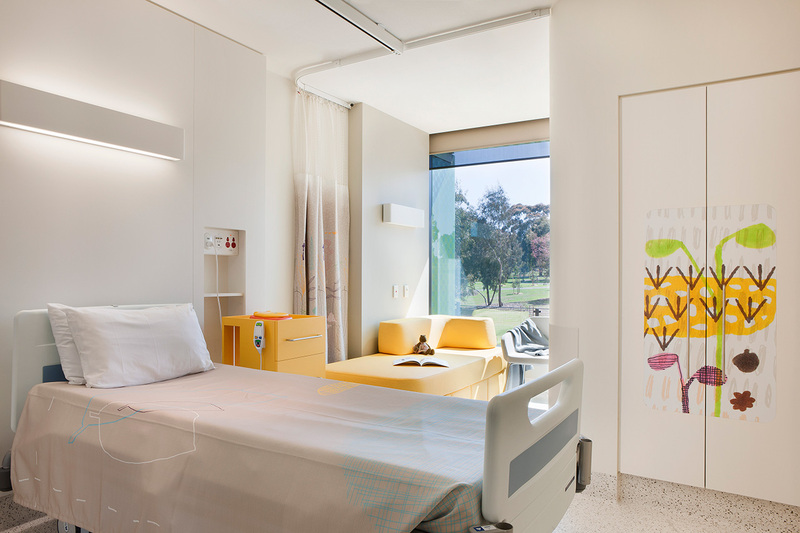 Royal Children's Hospital, Melbourne, by The Billard Leece Partnership and Bates Smart. Outpatient waiting area. Photograph by John Gollings. Click to enlarge. There is general agreement amongst the authors reviewed by Tofle et al that colour can elicit emotional response, define volumes, alter sense of time, affect thermal comfort, perception of weight, size, etc. The problem is that there is no reliable evidence to support these assertions, nor is there agreement amongst the authors on how these effects are achieved. The literature contains significant contradictions about colour associations: some see yellow as mood enhancing, while others argue it is unsettling, or it is to be avoided because of an association with urine. Some authors assign emotional meanings to particular colours. Some authors claim that red has qualities of energy and passion; yellow supports optimism; green provides unconditional love; blue promotes loyalty; and violet has spirituality, although these outcomes are unsubstantiated in the literature. Some suggest that cool colours make time pass more quickly, others say that time is overestimated with cool colours. Some say highly saturated colors are more appropriate for elderly patients than pastels and strong colors are good where muscular effort or action are required. Others argue that intense colours may be too controversial and trigger unpleasant associations in the mind. The list goes on. The report concludes that, like other theories in environmental design, colour theories have too often been strongly normative and weakly analytic. They have been used (abused?) to create guidelines and prescriptions for action, but they are too weak in predicting what the settings will be like when completed and how its colours will influence the users. According to Ruth Tofle, the specification of colours should center first on the role of the colour in the environment and the intended activities in the space: “The performance specification should be the starting point for the designer who should be allowed to create colour combinations for the sake of the users that drew both on art as well as science.” The problem is that without reliable research, without a clearer understanding of what is possible and what us not, it is very difficult to produce performance specifications of any kind. This new understanding can only come through more sophisticated longitudinal research in cross referenced, real-world settings. 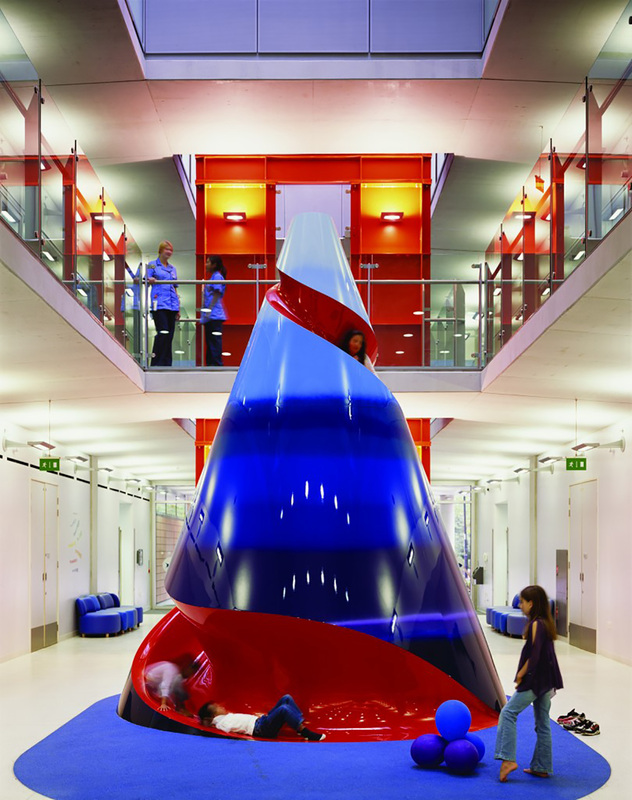 The use of colour in healthcare settings, currently is not based on reliable research. The attempt to formulate universal guidelines for appropriate colours in healthcare settings is, according to Tofle et al, “ineffectual”. We need to study systems, practices, and experiences outside of the laboratory, in their local context.